A new student mobility report finds that the number of Indian students going overseas was up sharply in 2014. This reverses a four-year trend of declining student numbers from India and, given the current scale and growth projections for Indian outbound, sets up in an interesting competitive dynamic among the world’s leading English-speaking destinations. The report, Indian Students Mobility Research Report 2015: Latest Trends From India and Globally, draws on a range of international and host country data sources to conclude that total Indian outbound was just over 300,000 for 2014. The report notes as well that roughly 85% of Indian students chose to study in five English-speaking countries – the US, UK, Australia, Canada, and New Zealand – and much of its analysis accordingly concentrates on trends among these key study destinations. The graph below demonstrates numbers for the aforementioned five destinations. Another key finding is that the growth in Indian outbound to these top five destinations exceeded enrolment growth from China for the first time ever. 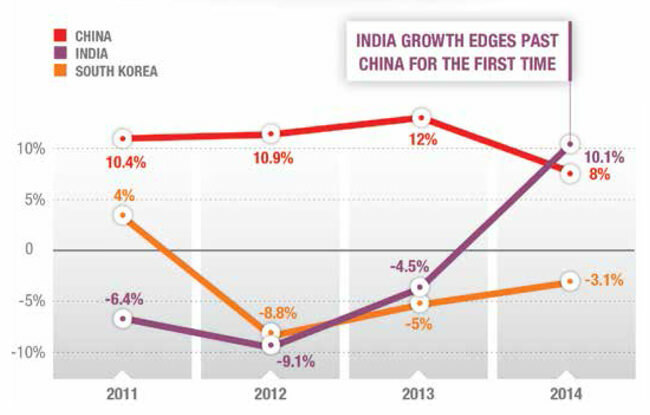 As the following chart reflects, Indian enrolment grew by 10.1% in 2014, as compared to 8% for China. “India is at the centre of action now, just as China has been for the past decade or so,” said Maria Mathai, the author of the report and director of M.M Advisory Services, a marketing and recruitment consultancy based in New Delhi. Other sources suggest a higher growth rate for total Chinese outbound in 2014. Notable among these is the Chinese Ministry of Education, which pegs outbound growth for the country at 11.1% last year. M.M Advisory’s findings, however, are largely concerned with mobility to the top five destinations noted above (given the very high proportion of total Indian enrolment concentrated among them). And the report carries some important implications for international educators in those host countries. Australia was especially hard hit as total Indian outbound numbers declined from 2009. 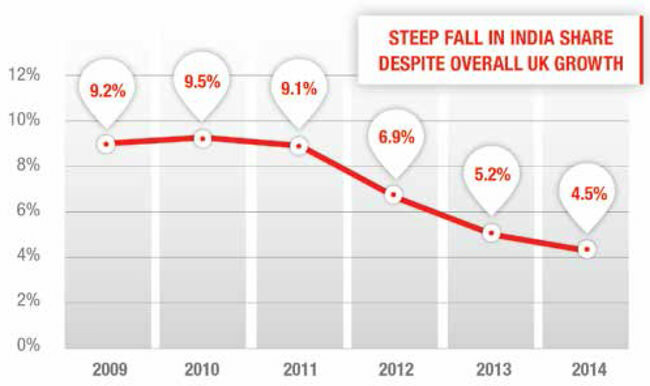 After four consecutive years of falling Indian enrolment from 2010 to 2013 (and three of those with double-digit drops), Australia saw a 28% increase in Indian student numbers in 2014. Indeed, the growth in Indian enrolment has been an important driver of the broader recovery in Australia’s international enrolment over 2013 and 2014. The report suggests that this recent growth has come largely at the expense of the UK (“With tighter work and immigration laws, UK is rapidly losing ground.”), but it also points to challenges for other destinations now that Indian demand is swinging back to Australia. M.M Advisory believes that Australia is also drawing some student demand from the US, for example, but America nevertheless recorded strong growth in 2014 (a 6.1% increase in total Indian enrolment year-over-year). The US remains the number one destination for Indian students, and demand is particularly expanding at the graduate level. As we have noted in earlier reports, for the second year in a row, US graduate schools increased their offers of admission to Indian students last year (25% more in 2013/14 following a 27% increase in 2012/13). The growth of Indian students in US graduate programmes has typically been uneven over time, but it has been sustained in the last two years. If this continues, it is good news for American graduate schools as India is predicted to have the most tertiary students in the world (48 million) by 2024. M.M Advisory has also found that the sharp declines in Indian enrolment in Australia from 2010 to 2013 largely translated into corresponding enrolment growth in Canada. 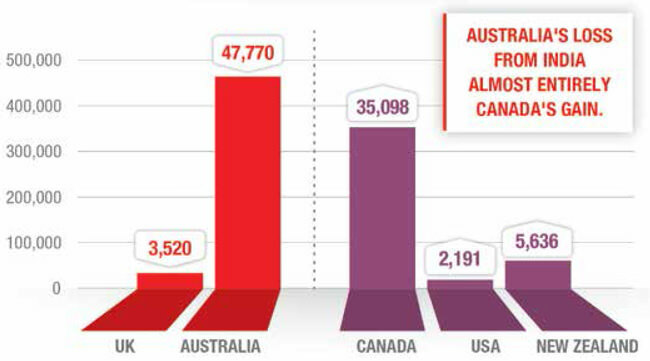 The report estimates that Australia lost nearly 48,000 Indian students over that four-year period, and, as the following chart illustrates, roughly 75% of those students ended up in Canada. One of the very important questions emerging from the report, therefore, is whether or not Australia’s resurgence as a leading destination for Indian students will begin to erode Canada’s Indian student numbers. For its part, M.M Advisory considers that Canada’s share of the Indian market is indeed at risk. “Canada’s intake grew sharply in the past few years, but as our Gains Analysis shows, most of this growth appears to have come at the cost of Australia’s decline – and that trend might be reversing now,” says the report. The report concludes that the same agents who shifted focus away from Australia (and in favour of Canada) in recent years are now helping to direct student demand back to Australia. Where Australia has reversed its recent-year declines through an intense marketing effort and renewed focus on the Indian market, the UK continues to see its share of the Indian outbound market decline. Total enrolment in the UK has been essentially flat over the past two years. A closer look indicates that gains from other key source markets, notably China, during this period have been largely offset by significant declines in the number of Indian students choosing to study in Britain. Indeed, Indian students accounted for 4.5% of total international enrolment in the UK last year, down from a recent-year high of 9.5% in 2010. In contrast, it appears that along with Australia, New Zealand has also been a beneficiary of the UK’s falling market share. Also in common with Australia, New Zealand has targeted the Indian market with an expanded marketing and recruitment effort in recent years. New Zealand saw its Indian enrolment increase by 49% in 2014 to reach a total of 17,850 students. This dramatic growth fueled an overall increase of 12% in international enrolment in the country last year, and has led M.M Advisory to project that New Zealand will surpass the UK (in terms of total Indian enrolment) by 2016. This entry was posted in Agents, Asia, Australia, Australia/Oceania, Canada, Europe, Higher Education, India, Most Popular, New Zealand, North America, Regions, Research, United Kingdom, United States and tagged tertiary education overseas, student recruitment, community college, college admissions, undergraduate student recruitment.